Edinburgh has always been associated with ghost stories, hauntings and unexplainable apparitions. 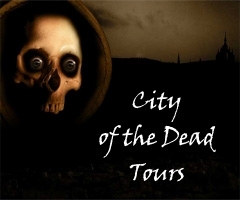 And for a city that has been well established since the 12th century, it is not surprising that the City of the Dead tours is compromised of eight different tours, revealing an insight into the dark and gruesome history of the archaic city. All tours leave from St Giles Cathedral on Edinburgh’s Royal Mile, don’t get left behind. Descend into the Underground City of the Dead tour, which culminates in a going underground to see a section of Edinburgh’s notorious Underground City, where a population once lived in complete wretchedness. Only recently unsealed, these vaults have been forgotten about for centuries, and the dark tunnels are said to be occupied by a malevolent presence known as the South Bridge Entity, which stalks the part of South Bridge know as ‘Damnation Alley’. Strictly adults only, you will understand why as you roam the dark, dank vaults and feel the presence of those who do not want you there! Other tours such as the Double Dead Tour, Haunted Graveyard Tour Children’s Tours are available and will spook you silly, as you learn fascinating facts about the history of the city, and its inhabitants.